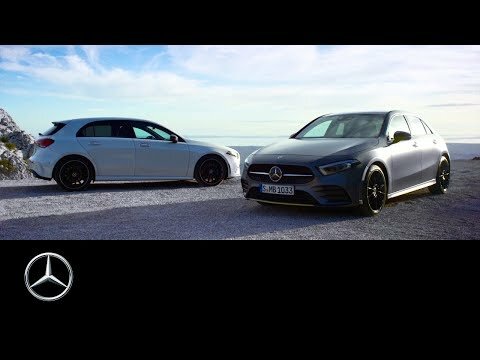 In an exciting premiere just before the 2018 Geneva Motor Show kicks off, Mercedes-Benz have unveiled the latest generation of their fantastic Mercedes-Benz A-Class hatchback. With a new interior, infotainment system and revised styling, the new A-Class aims to revolutionise luxury in the compact sector. The first thing that you notice when looking at the images of the new Mercedes-Benz A-Class is the renewed styling on the exterior. Remaining comfortably familiar in terms of proportions, the new A-Class demonstrates the same new design language that we’ve seen on cars such as the third generation Mercedes-Benz CLS. Despite retaining a similar silhouette to the previous generation A-Class, this latest version has actually grown in size very slightly and allows for extra interior space and a boot that is larger and easier to access. Exterior styling aside, one of the key exciting changes to the next generation A-Class is the interior. Much like Mercedes-Benz’ most luxury vehicles – the S- and E-Class – the A-Class’ interior is now dominated by two large free-standing displays and the quintessential turbine-style air vents. Available as two 7-inch displays, one 7-inch display and a 10.25-inch display or two 10.25-inch displays, these new screens – one of which is touchscreen - combine to offer the driver and occupants a whole range of clever ways to tailor how the car’s infotainment and driving displays are shown. There’s even the optional ability of using augmented reality to overlay directions and points of interest on the car’s camera feeds. Arguably the most impressive part of this new cabin, however, is the new MBUX (Mercedes-Benz User Experience) that has been added to the car for the first time. The innovative new system offers everything that you would expect from an infotainment system but also uses artificial intelligence to learn about the driver and adapt accordingly – one example used by Top Gear was that if you always switch radio station at 6pm for the news, it’ll remember this and start to remind you whenever the time comes and you’re in the car. The system ushers forth the next generation of Mercedes-Benz’ Mercedes Me connect services and can be controlled through steering wheel mounted touchpads, the large touchscreen display or by simply saying “Hey, Mercedes”. As well as the revised styling, both inside and outside, the new A-Class is being offered with three brand new turbocharged engines. These range on the petrol side from the A200 with a 163hp 1.4-litre engine and the A250 with a 224hp 2.0-litre engine to the A180d with a 1.5-litre diesel unit. When the car launches early this year, Mercedes-Benz will only be offering the A200 and A180d, with the A250 set to join the range proper in the summer. All of the new engines have been built with performance and efficiency in mind and therefore offer increased power whilst also demonstrating lower emissions and better economy. Combining Coupe styling with Saloon practicality, the new CLS is here. Mercedes-AMG Project One Premieres at Frankfurt.